This is a Beauty and the Beast story, which needs no introduction. 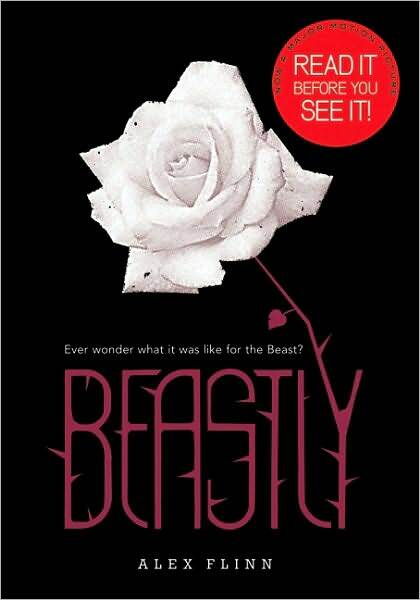 The twist is that the 'Beast' is in highschool, and the girl is too, so that the whole story is in the YA fiction genre. I enjoyed this book. It is incredibly romantic and sweet and tender. I loved the transformation of the 'Beast' from a selfish and contemptuous, immature boy, to a brave, kind and generous young man. I loved the story and I loved the supporting characters cast, each one in a different way. Even the 'Beast's' father was realistically indifferent to his son and his problems and I loved this kind of difficult situation the teen found himself in. What I didn't like about the book was the girl's attitude in the beginning of her acquaintance with the 'Beast'. It seemed as if she wasn't real, or even herself, according to what she appeared to be later. It seemed also as if the author was trying to make her seem saintly and good on purpose, like maybe an unnatural behavior was forced on her. It was fairly disturbing and it might have lead me to abandon this book as worthless, but her character soon changed. This undermined the book's value, of course. There was another problem, and that was the fact that there was very little imagination in the plot of the book. It was almost identical to Dinsey's Beauty and the Beast, which seemed a little silly. There are so many versions of this fairytale, why stick with the kids' one? Anyway, I certainly recommend this book as a very romantic story and one with a very strong moral value. I just purchased the "Beastly" book today. I'm looking forward to reading it, hopefully it wont be too bad :) Thanks for the Review Alexandra! I have this book just sitting on my shelf! I guess I'd better get to it befor the movie comes out! Thanks for sharing! you should read it, you guys, you won't regret it. thanks for commenting!